Okay , lets start off with a little history, the wild boar (that’s yours truly) is only exactly half a century young and from these precious years I have shared 30years of it with my other half side of bacon (wifey) . So that means I have celebrated 30 times her birthday , each with something very meaningful….hopefully that is. So for this 30th time I decided to take the afternoon off after lunch from my busy schedule to prepare a dish which is I shall aptly name The Emperor’s Devotion, ahem ahem its nice to be an imaginary emperor once in a while instead of a wild boar. There is always a quick fix in life with all the instant products you can lay your hands on but this has to be that little bit special …. No Quick Fix from Instant Products this time. So I popped in to my favourite Chinese medicine shop of mine to pick up a specially prepared concoction which is their personalise version of the Emperor’s Chicken Soup Mix.. What’s so special you may ask, yes its different because you get to sit down with your Herbalist and discuss on the fragrance you like or detest. For example too much Dong Quai, ahem, is not good for men please dun ask me here, we may have minors reading this article haha. Some may not like too much of it as it can mask other flavours too strongly. Well, to cut a long story short the guy pick up various ingredients and to this I added a small bit of Ginseng and that’s just a some shavings from the precious root. This was all ground up into a lovely smelling mix I guess about 30g in all. 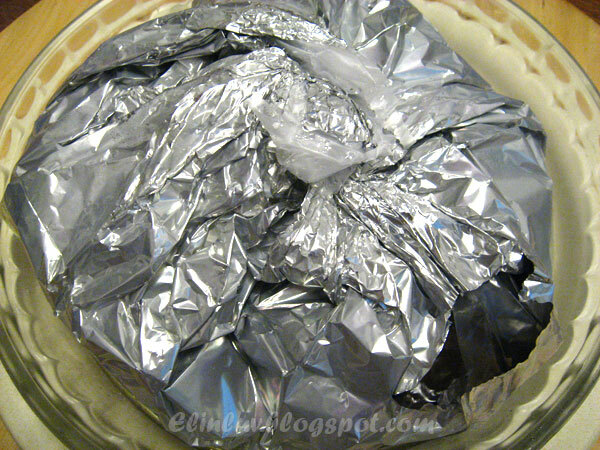 Earlier in the week I had managed to buy some HDPE plastic wrap and a roll of aluminium foil as this is required to wrap up the 2 whole chicken legs I bought from the supermarket. Just a quick note DO NOT USE ANY OTHER PLASTIC as it will not take the heat in the steamer and will leech out dangerous chemicals. 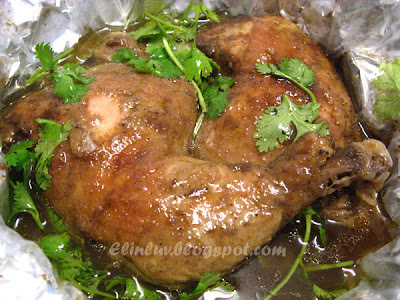 Trim off all the excess fats and some loose skin from this two whole chicken legs and pat dry with a paper towel. Sprinkle this herbal powdered mix lovingly over the legs and you may add a sprinkling of salt, add some ginger shreds . 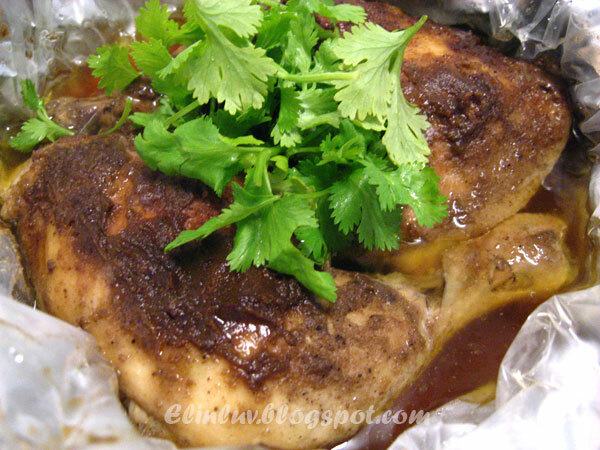 You need to wrap the chicken up in the HDPE wrapper and twist it tight. Repeat with the alumininium wrap to completely seal the flavour in. Put in steamer for about one and half hours on low heat after the steamer starts to steam up. That’s about it simple nice and nutritious ! I believe the pictures included will complete the story . 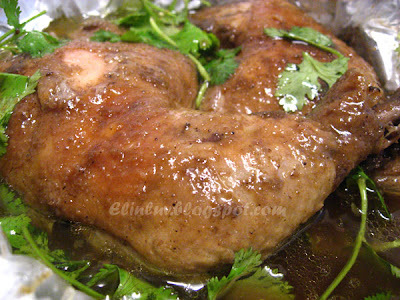 Upon opening the wrappers you will need to quickly bathe the chicken with the plentiful gravy in order to mix the ground herbs into the soup. You will be surprised that no additional water was added to the two whole legs and the juices were naturally extracted during the cooking process .The juicy meat deeply infused with lovely flavours from the herbs I will not be able to describe here, you must try it out yourself. After a lovely dinner, before I tuck her in to bed I served her ‘dessert’ as she usually sleeps very soundly after my ‘dessert’. I will not describe what’s for dessert ….. oh okay okay if you must know …. Spell it backwards please first word then second word SAVIHC LAGER. Oh by the way, I was served the best birthday cake she baked for herself , nicely topped up with Ferrero Rocher which happens to be my favourite. Thank you ,till the next upcoming episode . Elin, Wildboar...you two are born to be together! And congratulation for having celebrated 30 birthdays together...and many more to come! The chicken looks crazily delicious! May I ask, is there dong guai in this recipe? I need to abstain from this herb for the moment. Elin, congrats on celebrated 30th birthday together and you have a daring husband, so sweet. Hahaha! was so shocked! thought your husband is V funny! Sounds like it was a wonderful meal! You sound like you are having too much fun there!! lets hope your wild boar never gets too much Dong quai! Looks absolutely yummy - fit for an empress! LOL!!! Ohhhhh....how much Chivas did you two have? Wah...the kids not at home, honeymoon lah hor??? Wink! Wink!!!! Wow, it's very rare that the Emperor will cook for the Emperess, but then Birthday girl is the sure winner! Lucky you, your hubby can cook and pen! Plum Leaf...hahaha yup 25th every year :p he is funny alright. The only clown in the family ! Chef Dennis...hahaha you got it! nay he is smart...little dong guai for the aroma rather than for their nutritious value or he will suffer lol! Arthur...we had 4 years of honeymoon ...enough ! 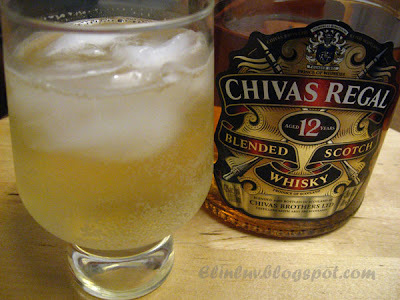 now can't wait for my gal to be back :) which is soon and Chivas...just two packs only ...good sleep after that lol! Kathy...yup, it was a wonderful dish...just nice for the two of us. I salute the wild boar. It turned out delicious ! To make him happy I had a big portion of rice ! aww so sweet, I wish my hubs would cook for me! Another of your blogs or somebody curi your recipe? what a lovely wild boar! !and even willing to write for your blog..i'm sure both of you had a very lovely evening together..the chicken, the chivas..i'm sure he was a very romantic guy when he was young...oops..or shouldnt use 'was'..he must be a very romantic fella! Congrats! No better way to celebrate than with a fantastic meal. Lena...he never changed since the day I knew him :) he is like me...thinks he is 25 every year that is why we matched in our thinking lol! Yup...my daughter eats cod and salmon ever so often there. I told her to eat as much as she can...as once she gets back here, no more for her. Too expensive. LOL!!! Awww ... Elin, that's so sweet of your hubby! He's darn funny, too! Young at heart, too, perhaps? LOL! What a lovely post, story and all. And sooo sweet...awww, you're so lucky. Looks delicious. I'm going to try that out using a baking bag instead of the HDPE plastic. Should work the same? Ping...yes, I have had good results using oven bags or baking bags from Reynolds or similar as these comes wif a nylon tie to seal in the flavors too . May i know what is HDPE plastic and where can i get it.